Belloccio Matte Blushes - Are perfectly pigmented to achieve a natural healthy-looking color that instantly brightens your complexion. Instantly brightens, is long lasting and helpful for keeping skin smooth and flawless. Belloccio blush was made to use individually and together to create a myriad of combinations. Blush can be applied before or after Belloccio Foundation. 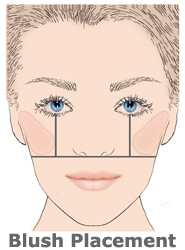 For a natural looking blush from within, you will want to apply prior to your foundation. For all you blush lovers; apply after foundation. Start light and work your way with more if desired. Apply blush no lower than the bottom of your nose and no further in than the pupil of your eye. This will not only enhance your cheekbones but also look as natural as possible with your desired look.